With mobile homes, you can save money and have a great home in Mooresville, NC at the same time. Anyone who still thinks that mobile homes are just for first-time home buyers and those with limited finances really should take another look at today’s mobile homes. While they are more cost-effective than other types of homes, they do not skimp on luxuries these days. In fact, we welcome you to check out our mobile homes at 1st Choice Home Centers. We think you will be pleasantly surprised by what you see! Mobile homes are constructed with rigorous regulations, just like any other type of home. They must be safe and sturdy. We only use high-quality building materials to make sure your home is everything you desire. Saving money by going with mobile homes is a wise choice for those who recognize that life can be more enjoyable if you aren’t putting every cent you earn into a roof over your head. When you see mobile homes and the beauty that is accomplished therein, we think you will agree that you can save money and have a great home at the same time. We have a number of mobile homes already in place on land that can be financed through us and moved into quite quickly. We also have land for sale throughout North and South Carolina, including the Mooresville, NC area, so you can choose the placement of your mobile home if you desire. You also have the choice of having us place mobile homes on land you already own or find some on your own to purchase. We welcome you to come by and ask questions about mobile homes or any of the other home building services we offer. 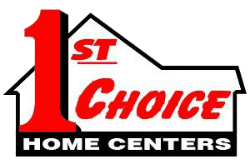 You’re in good hands with 1st Choice Home Centers!